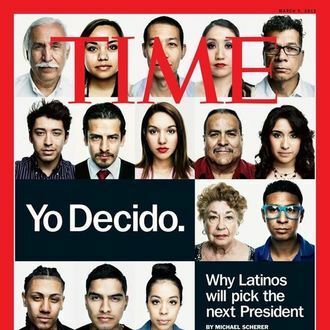 Time magazine’s cover story this week is called “Yo Decido. Why Latinos will pick the next President,” and it is illustrated with twenty portraits of Latino-looking people. We say “Latino-looking” because, as the OC Weekly points out, at least one person pictured is half Chinese and half white. “They never told me what it was for or [asked] if I was Latino,” said Michael Schennum, the man pictured behind the M.
About shooting the pictures in Arizona, Time’s contract photographer Marco Grob explained, “The terms ‘Latino’ and ‘Latina’ have a vast identity of their own, so for the duration of this project we strove to break some of those stereotypes.” While thought-provoking, that doesn’t really explain shoe-horning in any random nonwhite person, but it was almost certainly an innocent mistake. It’s just an unfortunate one to make tied to an article about the importance of demographics.